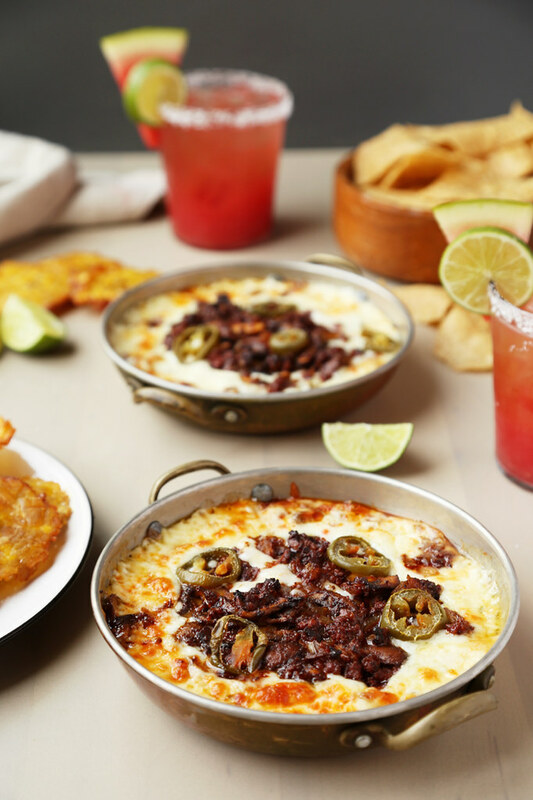 If queso fundido is on the menu (any menu), you better believe I’ll be ordering it and I’ll devour the entire dish all by myself. I’ll pretend it’s the most awful piece of garbage I’ve ever tasted, too, just so that I’ll be the only one eating it. “Ugh, you DO NOT want to taste this! Oh it’s awful! Yuck! You’re better off not trying it! I’m doing everyone a favor by eating it all, trust me.” Just the mention of queso fundido and all my self control goes right out the window. With this dish right in front of me, I forget about such things as portion control and moderation. Huh? Come again? Portion what? All bets are off. Can you blame me? I mean, who can resist a piping hot skillet filled with melted bubbly cheese? I count my blessings every morning, as soon as I open my eyes, thankful that I’m not allergic to cheese or dairy because if that were the case, I’d be suffering every single day of my life. I’d probably cry myself to sleep each night from the sadness. The thought of not being able to eat melted cheese dip frightens me. I’m terrified right now just talking/thinking about it. Let’s move on, I’m getting chills. Julian and I order this appetizer so often that I wanted to start making it at home for us. The worst decision I’ve ever made in my life, or the best? I haven’t decided yet, ask me again later. After a long and tiring work week, the greatest thing you can ever possibly treat yourself to is a few cold cocktails (obviously), queso fundido and a giant bowl of tortilla chips for dipping into said cheese. Picture it, you out in the backyard on a lounge chair right by a pool. The warm sun hitting your face. Drink in hand garnished with one of those tiny cocktail umbrellas (I love those umbrellas), someone fanning you as you lay back and worry about nothing, and just when you feel a bit hungry, there’s queso fundido right to the side of you for all of your snacking needs. Sounds amazing, right? Give it a try soon, but don’t say I didn’t warn you when you wake up in a daze not knowing where you are or why there’s cheese on your face and crumbs on your shirt (how embarrassing for you, pull yourself together) or why all of a sudden you’re wishing you had more mushroom and chorizo queso fundido on hand. It’s that addicting. No, scratch that. It’s magical. It’s an outer body experience and if food had the power to cure ailments, I swear this dip would be a miracle worker. Maybe I’m hyping it too much or maybe I’m exaggerating (I’m not) either way, if you have no idea what I’m talking about or have never tried fundido, you need to stop everything you’re doing right now and get in the kitchen. Okay, now that I think about it, it’s probably a bad idea that I’m making this at home now. It’s all I’m going to be eating for the next couple of weeks. Help! (But don’t help).